We have the receipt* of fern seed, we walk invisible (1 Henry IV., act iv. 4). 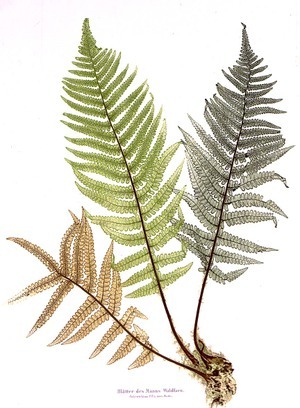 The seed of certain species of fern is so small as to be invisible to the naked eye, and hence the plant was believed to confer invisibility on those who carried it about their person. It was at one time believed that plants have the power of imparting their own speciality to their wearer. Thus, the herb-dragon was said to cure the poison of serpents; the yellow celandine the jaundice; wood-sorrel, which has a heart-shaped leaf, to cheer the heart; liverwort to be good for the liver, and so on. * Grind all together, mixing well. Add 9 drops almond tincture (almond cooking extract is great.) with enough spring water to make everything barely moist, and mix in well.